Over the decades I’ve been involved in building many home additions. Prior to the start of each project a tremendous amount of home addition planning was done. My home addition planning always started with a blank sheet of 8-1/2” x 11” paper and writing down what the purpose of the home addition was and the top level features my wife and I wanted in it, be it a family room addition, garage addition, or kitchen addition. Once I fully defined the main objectives of my home addition project, I then began to actually sketch out the basic home addition plans. Initially I would start out with pencil, graph paper and ruler. I would draw the specific scaled outside dimensions of the addition, along with the various internal wall, door, and window locations. In the process I would also find out the various sizes of appliances, and plumbing fixtures that were required of the home addition so that they could be properly drawn to scale in the home addition plans. This way I could confirm that the addition and all the various rooms or walls within it were of the right size dimensions. By going through this level of home addition planning I could, for example, ensure a toilet wasn’t protruding out so far from a bathroom wall that the bathroom door couldn’t close. As part of my home addition planning and sketching, I also made sure to show the exact locations of doors and windows, as well as how the doors swung open. I even went as far as to draw in footprint areas for the expected pieces of furniture to ensure there were sufficient walking lanes and open space throughout the home addition. After sketching out the home addition floor plan, I then began to sketch out exterior drawings of the addition. Of chief concern when home addition planning is to ensure that the addition melds nicely into the existing home. For example, I focus on the home addition elevation and where the home addition roof line ties into the existing home. More specifically I develop detailed sketches to find out where the home addition will intersect any existing windows or roof lines on the main home. I also determine how the base of the home addition matches into the main part of the home. By paying close attention to these particular areas you can help to ensure your home addition plans tie in nicely with the rest of the home, and in many cases prevent unwanted surprises down the road. The last thing you want, for example, is a home addition that perpendicularly ties onto the backside of your main home with a roof peak that extends above the roof line of the main home. I’ve seen a number of these home addition flubs over the years and they look unsightly from the curb. After fully fleshing out the paper sketches and drawings, the next stage of my home addition planning is transitioning them to the computer and a home design software package. With a home design software package you can create all types of floor plans, views and elevation drawings. They also offer the ability to integrate appliances, cabinets, furniture, and even show different types of wall and floor coverings in your home addition plans. I will say, however, it does take some ramp-up time to come up to speed with these home design software packages, and why I always recommend starting out your home addition planning with just pencil, paper, and ruler. This way you don’t get lost in the technical weeds of a software program while you initially are defining your home addition. This said, home design software packages provide incredible value as they can produce scaled drawings, various views, and material lists. They also offer the flexibility to easily change dimensions and features of the home addition so that you can quickly evaluate different options in planning your home addition. Another major part of my home addition planning has been to always go out and visit the building material stores to check out building products and prices. 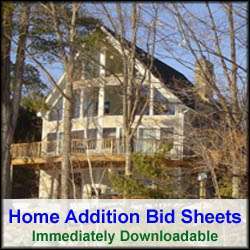 This way I could develop a materials list and an accurate home addition cost estimate, at least for the materials. After completing my home addition plans and printing them out, I’d then visit my local building inspector to review the drawings and pull the permits. In some cases, where I contracted the work out, I would provide the prospective contractors with copies of the plans so that they could quote them. I made sure that the home addition plan provided to the contractors also included my materials list so that the contractors had no choice but to stick with the materials I specified. This helped ensure that quotes from competing contractors were consistent, at least in construction and materials. With this process of home addition planning I’ve been able to avoid costly mistakes in building homes and home additions. I’ve also prevented many unwanted surprises, kept building schedules on track, and kept contractor proposals honest. 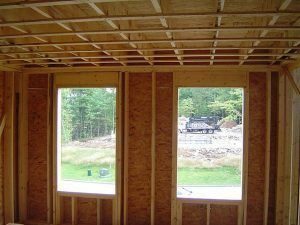 If there is one general take-away from this article that you should focus on, it is that you do your home addition planning up front and not during the actual construction.